Hearn’s is probably the oldest bike shop in the country, and they have some very cool antique bikes to prove it. Since the beginning, Clark and the team at Hearn’s have been there whenever we needed, no matter how big or small our needs. They help our riders with repairs and have helped get more than a few on new bikes. The most recent cool thing they did for the team? 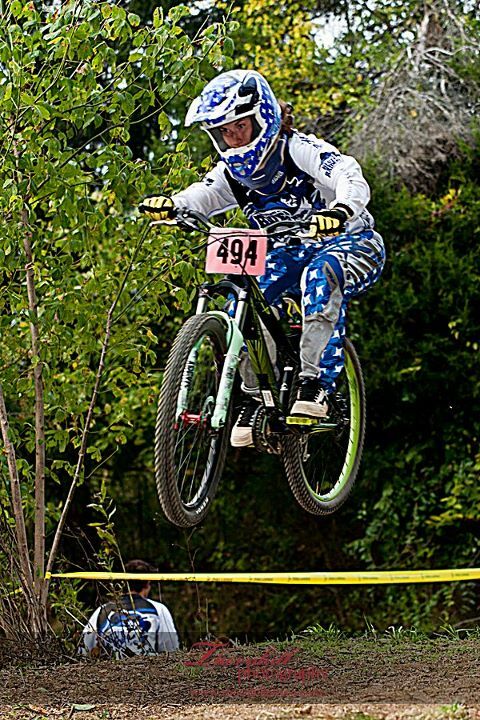 They supplied three of our riders with gravity bikes so they could compete in downhill, dual slalom, and four cross events in preparation for upcoming Collegiate Mountain Bike Nationals. They are officially the sponsor of Mar Hill’s growing gravity team, and we thank them for their generosity. Go visit Hearn’s at 28 Asheland Ave in downtown Asheville. Thanks Hearn’s! Of course, none of this would be possible without Mars Hill College. The administration has been great about increasing our resources as we’ve grown. They made us the cover of the new Mars Hill Magazine, which is a huge honor. They also bought the team a new mini-bus. Did I mention that they nearly tripled our budget over last year? Thanks to the president and his team for recognizing our success and promoting the team’s future growth. But we would be remiss if we didn’t also include in our thanks the rest of the MHC community. Faculty and staff from all the different departments have been keen to help and quick to voice their support. And then there are the parents who have stepped in to help with recruiting, officiating, sponsorship, and fundraising. Alumni and other supporters like Donald Dixon, Jay Hirst, and Dotty Caudle have also stepped forward with generous cash support. And now that we have some graduates from the program, they’ve stepped up as young alumni to lend a hand in bike repair, graphic design, and coaching. We have a great thing going here, and we wouldn’t be on this upward trajectory without you. Thanks for everything! Crystal Kalogris flies over the final jump to win the women's four cross event. Photo courtesy of Thornhill Photography. After a nearly decade-long hiatus from hosting races, Alexander Mountain Bike Park returned to action last week with collegiate and open racing that included both endurance and gravity events. Mars Hill College hosted the collegiate racing on Saturday and Sunday, and over 20 schools attended, including out-of-conference schools Lindsey Wilson College (MWCCC) and Appalachian State (ACCC), which made for some action-packed racing and spectating. Saturday was crammed full of racing with three events scheduled: downhill, short track cross country, and four cross. With unseasonably cool temps blowing through the top of the park, many DH riders shivered in wait for their turn down the short but technical course. Wes Lamberson (Union) had the hottest run of the day to win the men’s A race by an impressive four seconds. In women’s A competition, Kate Weisenfluh (Brevard) was quickest but just barely; Crystal Kalogris (Lindsey Wilson) finished within a second. Next up was the short track, which featured spectacular starts to each event as riders negotiated a patch of boulders before hitting the first single track section of the course. Lap times were fast on the short loop, which included a wider, steep finish straight and a technical single-track backside. In the men’s A race, Mars Hill’s own Tim Jenkinson took the hole shot and finished a strong 4th. Kerry Werner (Lees-McRae) won in convincing fashion, after recovering from a mid-field start. In women’s A action, Mars Hill again proved fastest at the start with Klara Rossouw taking the hole shot. After sticking with Erica Zaveta (Lees McRae) for several laps, Rossouw hung on for an excellent 3rd while Zaveta won and Eva Wilson (Warren Wilson) claimed 2nd. Saturday’s final event was the four cross, featuring a newly built course on the site of an old dual slalom course that hadn’t been used in many years. With big berms, jumps, and vertical drops, there was plenty of action for riders and spectators alike. In men’s A racing, Logan Collins (Lindsey Wilson) won the final heat, and his teammate Crystal Kalogris handily won the women’s A final. After some much needed rest, racing resumed on Sunday for the cross country events. Held on flowy and technical singletrack with constant, punchy elevation changes from 2300-2800ft, racing required constant focus. Following up on their short track wins from the day before, both Werner and Zaveta proved strongest on the longer courses as well. Full results for all categories can be found HERE. Additional pics of the action can be found on our Facebook page. We want to thank Asheville Bicycle Racing Club (especially Marios and Steve), Craig of Ski Country Sports, David Ross of Falcon Development, and Jon Marsden for use of their tools and equipment (from shovels to Bobcats) in helping get these courses in shape. However, we appreciate even more the sweat equity they invested in renovations made to Alexander Mountain Bike Park. Because of them and the hard work of Mars Hill College students, the park is witnessing a renaissance, so get out there and ride and see what great shape the trails are in. And let’s host more races sometime soon!